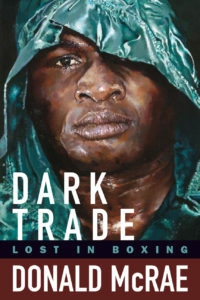 Dark Trade: Lost in Boxing, by Donald McRae, award-winning author of eleven non-ﬁction books and staff writer for The Guardian, is widely considered of one of the best boxing books all time. This is a new edition, released in the United States for the ﬁrst time, that includes a new chapter by the author, plus a stunning cover that features a painting of boxer James Toney by noted boxing artist Amanda Kelley. There is no other sport like boxing. Over twenty years ago, Donald McRae set out across the United States and his adopted home, Britain, to find deeper meaning in the brutal trade that had transfixed him since he was a young man. The result is a stunning chronicle that captures not only McRae’s compelling personal journey through the world of professional prizefighting, but also the stories of some of its biggest names—James Toney, Mike Tyson, Evander Holyfield, Oscar De La Hoya, Naseem Hamed, and others. Find it on Amazon, or get it at your local bookstore through IndieBound.org. See what readers are saying on Goodreads. This title is available with Baker & Taylor, Ingram, Bookazine, and Brodart.